Physical Description At 5'0" and roughly 98lbs, Xue’Daio is a tiny, refined looking woman who wears her elevated social status proudly. Having not been cut since she was born, her hair drags the ground when allowed to be loose. As an albino, she’s extremely pale with the only pigment being standout spotting associated with the species. Her eyes, instead of the standard blue-green, are pale amber-pink. * The mark of the royal crest resides at the hairline behind her right ear, but the brand is pink and blends in with her fair skin unless one knows where to look. *Freckling across her brows creates a circlet like appearance of larger spots that tip in a ‘v’ between her eyes before arcing over each eyebrow and on over the temples and into the hair line. Sparse freckling along the center-line of her body, the heaviest spotting is down the sides of her neck, outer/sun exposed parts of her arms, ribs, hips, and outer portions of her legs. Personal History Xue’Daio Nox is a child born of privilege on Federation Stardate 239603.12 on the Stenellis home world of Apsha. 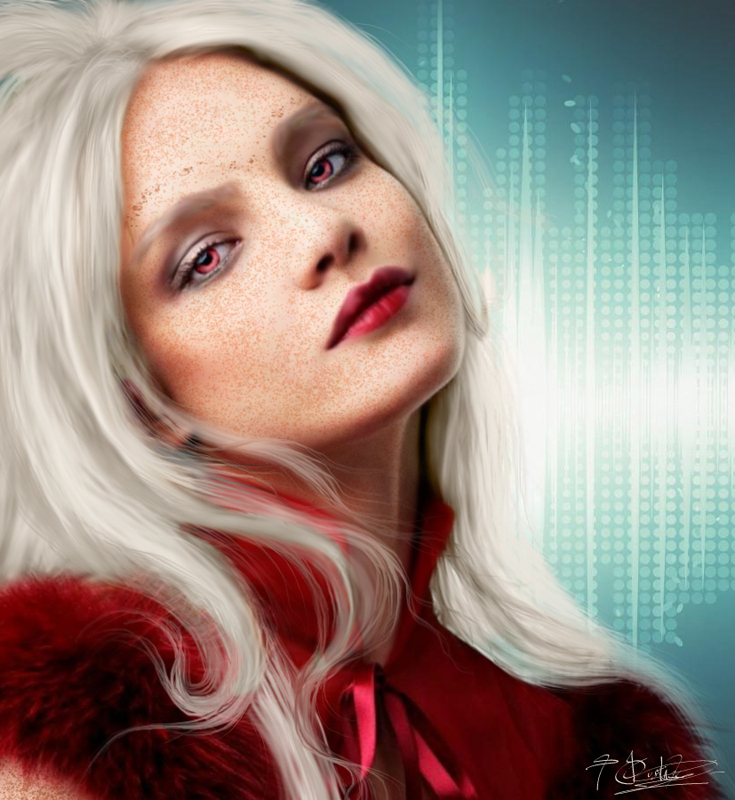 Her genes are yet another of the species' anomalous unknowns as she is the only known albino member of their society alive or dead. She is the daughter of Empress Psy’Daio Nox and favored consort Kiv’Watt, previously of the Makta caste and a revered warrior for leading a strike against a group of Ferengi that had attempted to settle one of Apsha’s outlying moons in 2389. She is the eldest child of the Empress, the next eldest being her younger brother (born in 2411), and subsequently the next in line to become Empress unless the ruling house of Nox is over thrown, something that has not been successfully accomplished in over three-hundred years. Xue’Daio has not taken any concubines, making her mark in the world as an extremely strong and likely single ruler and rumored to be the first 'virgin queen' in over three thousand years. Every attempt by the Empress to see her court a companion has resulted in near disaster for the man and shame to his family name. The young princess is well known for her skilled ability in the art of hand to hand combat, something that her father has been all too proud of his hand in teaching her – much to the chagrin of her mother who has long since chosen the path of a scholar and conducts herself with a great bit more diplomacy than her often spiteful and ill-tempered daughter.